Large spray booths are mainly necessity of painting of large work pieces like trucks , trailers & buses. India being a growing and booming market for all kinds of products , transportation industry is always seem to be having high demand for manufacturing of trucks , trailers and buses. About 30 years back Indian economy was not so fast moving,therefore the trucks manufactured during those time didn not necessary require the quality standards as strict as present day . The requirement of paint finish also prospered with the high demand for trucks and transport vehicles in present years . Perviously the concept of having a dedicated Truck paint booth was not necessary and most of the trucks & trailers used to be painted in the open without need for trailer spray booth. As years past by and collaboration of transportation industries with European and Japanese industries changed the mindset of the routine painting methods without truck spray booth . Surface preparation for the truck body parts now became a must as they had to pass the quality checks of the foreign markets. India being on equator line always has to face all the different seasons of the year with monsoons of almost 4 months . If the surface preparation and pretreatment of the truck body parts is not been done in a proper way or neglected, the paint a Paint adhesion will be a serious problem and more worst will be the corrosion. The truck Body is divided into 3 major body parts . Each of the above has a separate painting booth or a panting line depending on the capacities required .Every part goes through a series of surface preparation like either chemical based pretreatment or shot blasting method . Thereby confirming the truck body free from oil & rust and ready to be painted in the truck spray booth. Autocoat Engineering is in the manufacturing of Truck & trailer paint booth for almost 35 years , which are in complete use with full customer satisfaction. 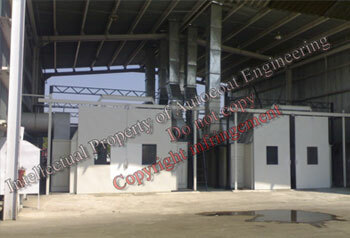 These spray booth are with very versatile design of water wash downdraft booths & dry downdraft booths. Our trailer paint booths with water model can handle almost any kind of paint & any paint quantity liters. The paint sludge removal solutions attached with our truck paint booths works as a fast solution to cleaning and maintenance of the paint booth. The paint used for truck painting are very thick and therefore it is always recommended to go for Autocoats Truck spray booth water type downdraft booth. As explained above the necessity of paint booth in painting of trucks and trailers grew , similarly other streams like bus manufacturing also parallel grew. Human commuting traffic & public transportation is becoming every day concern. Due to shortage in railway booking availability, movement of bus play very important role in human life in India. In older times only option for travelling used to be government buses only either commuting or state to state travel. But as the demand is high lot of private non government companies are constantly introducing new and latest kind of Luxury Buses . Theses luxury buses are very stylish and with maximum comfort for travelling . Therefore the painting and paint finishing of these buses have to be very clean & ultra finished. 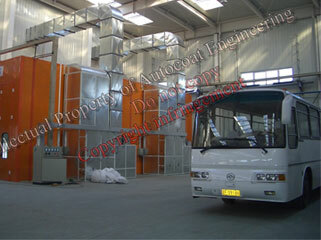 Autocoat along with its counter tie up from china have introduced many models of such specialized bus paint booths in India. These bus body spray booths are able to give a very clean environment in the painting area with a very low dust count of 5 to 10 micron level, depending on the paint finish required. iii) Separate blowers to replenish air in the paint booths , which work as an air supply unit and provides equal quantity of air exhausted. iv) Separate filter zones of incoming air from outside to the air supply chamber and separate set of celing filters (upto 5 to 10 micron dust level) before air enters the painting room. vi) Since bus cannot be shifted to a drying area after painting , our Bus spray booths have complete heating facility to paint baking purpose. vii) Autocoat bus body paint booths are available in all 3 types of heating system , electrical heating , gas heating and diesel heating. We also supply 3 axis platforms for the painters efficiency which can move lengthwise, height wise & widthwise in a short portions. These platforms not only increase painting efficiency in the bus spray booth but also are capable to handle any rework operations & reduces operators fatigue. India been the fastest growing market in the whole world from automobiles to home appliances , energy saving products to power generators ,there is always a need for faster and speedy transportation system. Railways are always considered to be the highest efficiency transportation system , as it can carry large amount of goods and human traffic with lowest fuel requirement. In India in addition to standard railways , Metro trains , monorail trains & bullet trains( high speed railways) are been introduced . In many cities monorail trains and metro trains are already in use. 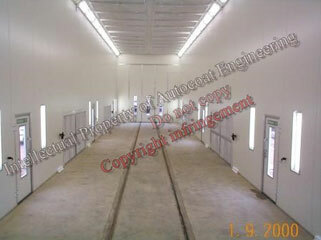 Autocoat Engineering has been fortunate to be a part of the metro train painting line . We have supplied railway coach paint booths to few companies for the painting of metro train face , which is made of fiber glass body .The railway spray booths supplied by us are also used for the painting of the interior bodies on the railway & metro trains.Thses interior are body are made out of plastic or frp sheets with the use of gel coats and then been painted with different colours in paint booths supplies by us . The built in heating technology in our booths play an important role of drying the plastic paints as soon as the painting operation is completed . The dust free setup inside our paint booth enhances the quality of the dried paint and reduces the rework activities due to dust & over spray. The dried parts are now totally ready to be assembled with railway train body.